We all have 12 month multiple entry visas, which apparently means we are able to come to country as many times as we want in a year, but we can only stay for 30 days at a time. We can apply for an extension that will let us stay for 90 days, but we still must leave the country after that. Thankfully, we live only an hour and a half away from the Zambian border. The drive to Zambia was very nice, with the only exception being the border crossing. However, after fending off all the moneychangers, we finally made it to Zambia! We arrived at a nice little hostel, had dinner, and went to bed. The hostel was on beautiful grounds, had a campsite, and a shower that hosted my first warm shower since moving here (yay!). It was interesting talking to the hostel owners. They were Italians who were born in Mozambique and spent most of their lives going between Mosambique, Zambia, Malawi, and Italy. 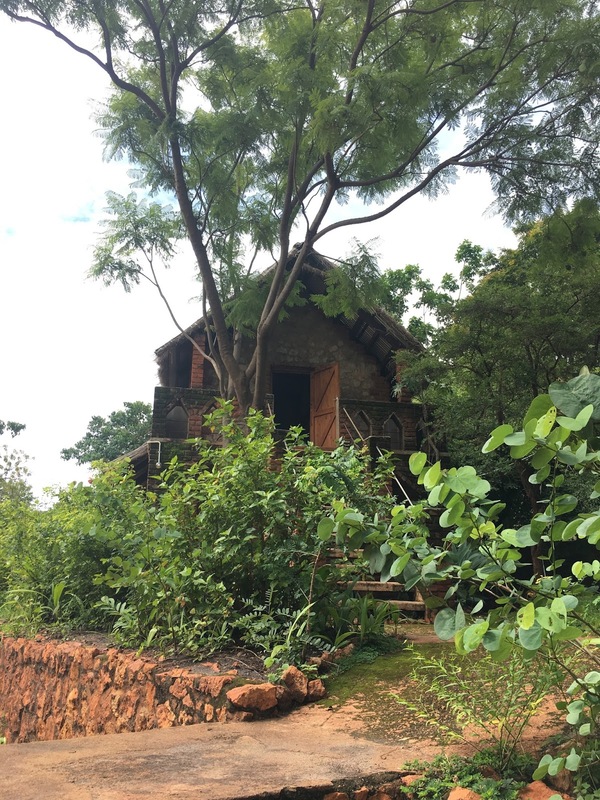 Our second full day in Zambia we had to opportunity to go to Filius Jere’s house and then to the new church hall. At Filius’s house he showed us pamphlets he translated into Nyanja. Besides using his radio station to broadcast Beyond Today episodes, he also works on translating UCG’s booklets into Nyanja for members and guests to easily read. I was quite inspired by that and want to find a way to translate the booklets into Chichewa so our brethren here who don’t speak English can access the booklets as well. The church hall in Chipata was fantastic! It’s not big, but it will seat around 100 people (most people sit on the ground, not in chairs, so it’s easier to fit more) and behind the building there’s an outdoor kitchen area where we talked with women who were preparing tobwa, the maize drink I talked about in my previous blog. Similar to Malawi, maize is grown everywhere. Wherever there’s an open spot of land, there’s maize. The church hall was surrounded on three sides by maize, groundnuts (peanuts), okra, and pigeon peas (lentils) that were tended to by the members. Filius told us how they organically fertalize the fields with compost and a special plant. The results were amazing! The maize ears were bigger than ones that had been treated with chemical fertilizer. I loved seeing how involved the members were with everything. The congregation’s youth and a few adults built the hall themselves. It was so inspiring to see a family that God had grown together in just two years. We didn’t know until arriving, but the Sabbath we spent there was the first time they had ever used the hall. There was a great celebration that included dedications and thanks, personal speeches about how different individuals were called, skits about keeping the Sabbath, a youth rap on the 10 commandments, a question and answer session, and, of course, food and tobwa. Filius had invited the land’s previous owner to services and the dedication where she was given a seat of honor and two live chickens. The members lovingly gave Lewis, Lena, Brennan, and me two doves that we named Peggy and Lil’ Nugs. Brennan got to experience, for the first time, what it’s like to speak while using a translator! 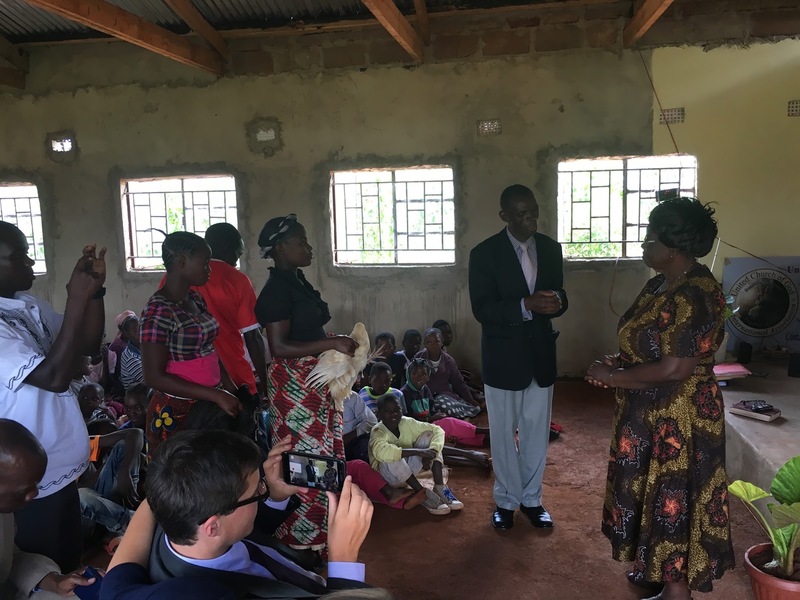 When we were introduced to the congregation, we were introduced as “our brethren from Malawi” or “the Malawian brethren,” which I found pretty funny. The day as a whole was just amazing. The next day we drove home and reminisced about our time there. I was so inspired by the community God built. How can we bring that back home with us? Hostel cat Gregio. Made me miss Kitty and Sparta! These past two weeks we’ve been to Nkhotakota, Blantyre, Thyolo, Dedza, Mchinji, and most recently Chipata, Zambia. We’ve been traveling in a Mazda Bongo that sits 12 if we use the collapsible seats, and 16 if we squish in. This vehicle, by nothing short than God’s blessing and will that we travel, has made it to all of these cities, over tree stumps and out of small ditches, down dirt roads that are mostly potholes, and dirt roads that you have to “drive very quickly” down to avoid tipping because there’s such a big ditch in the road. I love this vehicle! On Wednesday we drove to Chipata, Zambia to visit the brethren there and get our visas renewed. We have 12 month multiple entry visas, but still need to leave the country every so often and reenter. Anyways, we drove about an hour and a half to Mchinji to visit the Chmpalas and their private clinic. The last time I saw their clinic was 5 or 6 years ago and wow! It’s so different now! The clinic is painted in vibrant orange and blue and contains normal patient rooms, a family planning room, two offices, a voluntary medical male circumcision room, a surgical room, and more. It’s huge! After leaving the clinic we went on a short side trip to find a fire extinguisher (may or may not be required to have in our van, it’s kind of hard to tell genuine laws from exaggerated ways to make money) and then onto Zambia! One of my favorite things about the Bongo is that it isn’t a “mzungu” vehicle. Once people notice the four white people inside they stare, but before they notice, the Bongo looks like a minibus taxi and we get by without attracting too much attention. That being said, we tend to really confuse police. Four Americans driving around in what looks like a taxi but is actually a private vehicle that’s registered in Malawi and has an American’s insurance on it. Huh. We got to try a much-loved traditional Zambian drink made out of fermented maize and sugar. I think it’s an acquired taste… Our time in Zambia was wonderful, but it also feels good to be back home in Lilongwe. It’s amazing how many people are being called all over the world. We’re used to our comfortable congregation where we get excited when there’s one new visitor, but in Chipata they tend to have around 20 new visitors each Sabbath. The deacon there has a popular radio program and broadcasts applicable Beyond Today episodes. 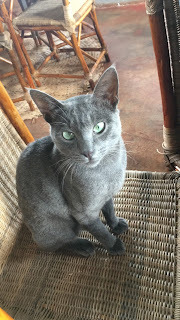 I’ll write more about him and the Chipata congregation later—too much for one blog! Seeing life here is changing our perspectives in so many ways. It’s sad how we will do ridiculous things like say we’re too tired from work to go to church, or just need an “alone” Sabbath. Here, our brethren are struggling to make it to church because of funds, they’re going without some meals so they can afford the taxi (the taxis like our Bongo) to services for only one or two members of the family. Living here is showing us how much we need God’s Kingdom. One woman asked us, “What do you imagine when you imagine it? How can you picture God’s Kingdom when you are already living in it in America?” God’s children are hurting in Africa; children are balding because of malnutrition, mothers are exploiting their children for money, wars are being fought, and beliefs in witchcraft and potions are destroying lives. This hurting won’t stop until God’s Kingdom comes. Please pray for us for temporary relief in this life and for the permanent relief that is God’s Kingdom to come soon.